Five stories about young Amelia Bedelia—plus fun games, puzzles, word scrambles, and an exclusive sticker sheet—make Amelia Bedelia Storybook Favorites an irresistible read-aloud, the perfect gift book, and a terrific way to explore the English language and expand vocabulary! 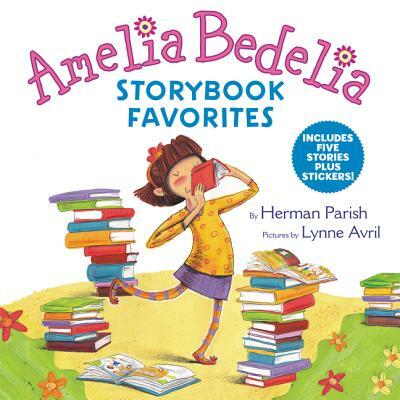 This storybook collection features five previously published stories about the childhood of Amelia Bedelia, including Amelia Bedelia’s First Day at School, Amelia Bedelia’s First Field Trip, Amelia Bedelia Makes a Friend, Amelia Bedelia Sleeps Over, and Amelia Bedelia Hits the Trail. The Amelia Bedelia books are great for reading together and for children just learning to read on their own. Amelia Bedelia’s legendary mix-ups with words, idioms, and language make practicing reading comprehension and expanding vocabulary fun. This 192-page book is illustrated in full color throughout and also features games, puzzles, and a sticker sheet. With Amelia Bedelia, anything can happen—and it usually does! This compilation was originally published as Amelia Bedelia Storybook Treasury.